Nationwide Title Clearing, Inc, was named one of Tampa Bay’s fastest-growing companies and earns number 26 on the Fast 50 Awards List. Nationwide Title Clearing, Inc. (NTC), a leading service provider to the mortgage and financial industry, made the Tampa Bay Business Journal’s Fast 50 Awards list at number 26, despite the fact that the U.S. economy is still struggling to right itself—in the first quarter of 2013, the economy has experienced a dismal 1.7% growth rate (1). The Tampa Bay Business Journal unveiled its annual list of the fastest growing companies in Tampa Bay in July, 2013. ● The company must have had annual revenue of at least $1 million in 2012 (2). Largely because of its ability to deliver highly accurate and fast results, the growing need for stability in the finance sector has leveraged NTC into a position of leadership—NTC’s clients include eight of the 10 largest banks in the U.S. The company’s advancement of the mortgage assignment chain verification process, PerfectChainSM, is another means by which NTC has been working for years to develop much-needed industry best practices in order to help legislators, mortgage lenders, servicers and homeowners gain certainty and confidence. Perhaps best known for its expertise in lien release processing and management, NTC is an advocate for best practices and legislation that standardize the mortgage industry and ultimately benefit the American homeowner. Since its inception, NTC has been dedicated to performing document research services and processing documents and has become known as a leader for best practices in the post-closing mortgage industry. The Fast 50 Awards is sponsored by Shumaker Loop & Kendrick LLP, CBIZ Kirkland Russ Murphy & Tapp, Grow Financial Federal Credit Union, and the Museum of Science & Industry. As part of the Fast 50 Awards, NTC was invited to attend an awards luncheon at the A La Carte Event Pavilion in Tampa. 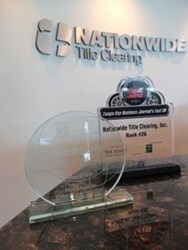 For more information about Nationwide Title Clearing, Inc., and its services, visit http://www.nwtc.com. Based in Palm Harbor, Florida, and founded in 1991, Nationwide Title Clearing, Inc. (NTC) is a privately-owned leading service provider to the residential mortgage industry, serving mortgage lenders, servicers and investors, including eight of the top 10 residential mortgage servicers in the country. NTC earned the position of #2,730 on the 2012 Inc. 5000 list of fastest-growing private companies in America, ranking #36 in Tampa and #46 in the real estate industry. The company’s land records and document experts are able to track and fulfill county document requirements for close to 3,600 recording jurisdictions nationwide. NTC specializes in providing land records research, lien release services, assignment services, final document tracking, document retrieval and other custom business solutions. For more information, visit the company’s website at http://www.nwtc.com. 1.Blodget, Henry. “Here’s Who To Blame For America’s Lousy Economy...” Businessinsider.com. Business Insider, 31 July 2013. Web. 31 July 2013. businessinsider.com/why-economic-growth-is-so-slow-2013-7. 2.“2013 Fast 50 Award Nominations.” Bizjournals.com. Tampa Bay Business Journal, n.d. Web. 31 July 2013. bizjournals.com/tampabay/nomination/46571.